In spite of all modernistic decor trends, sometimes we simply can’t help but yearn for the decor principles of times past. Each era carries its own interior inspirations. 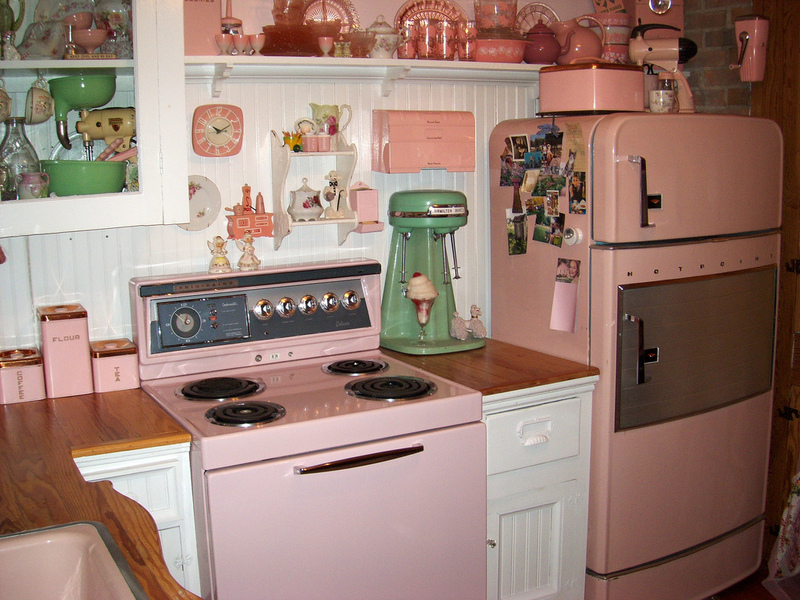 The 1950s, for example, were the epitome of pastel decor. 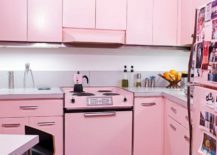 The kitchens especially were dressed in pastel colors from top to bottom, giving off a soft but dynamic feeling that you can still get in a typical retro American diner. But even though those times have passed, it doesn’t mean that we have to let go of the charming decor influences; not at all! 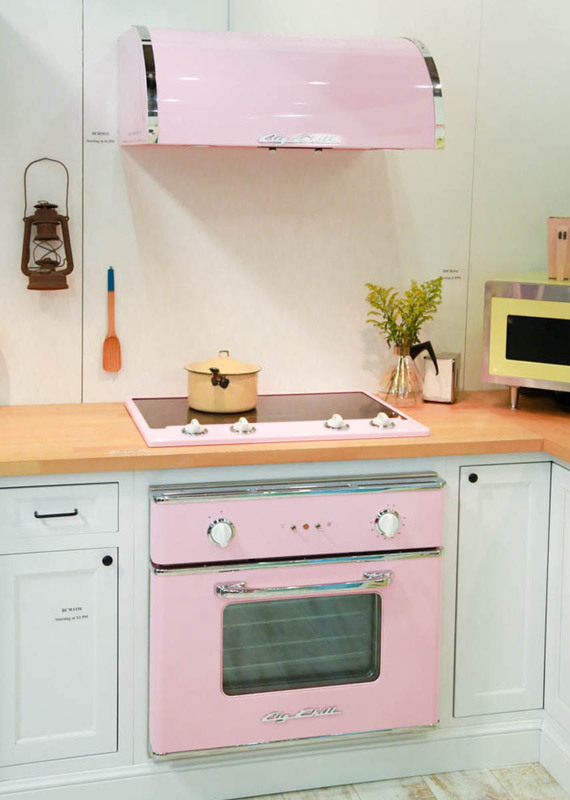 Take a peek at these 25 pastel kitchens that channel the 1950s and get some inspiration! 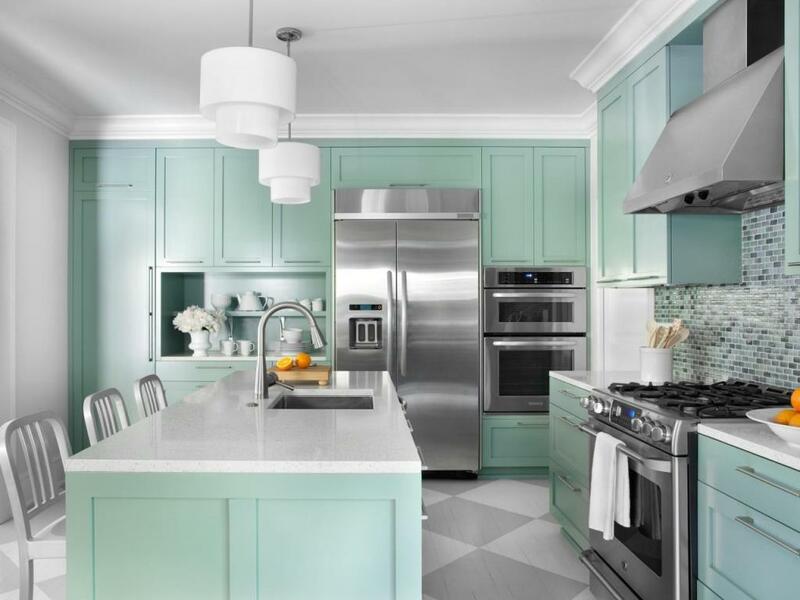 The reason this particular color palette is so unique is because the mint hues are definitely making a comeback! They are incredibly popular! 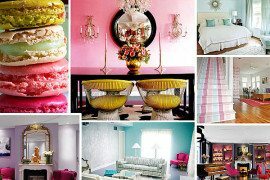 It’s a way to combine modern with retro, the dynamic of the color with the softness of the pastel. 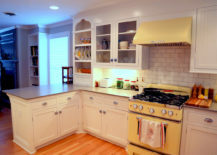 Your kitchen will look absolutely gorgeous and every time you step into it will feel like entering into another time! 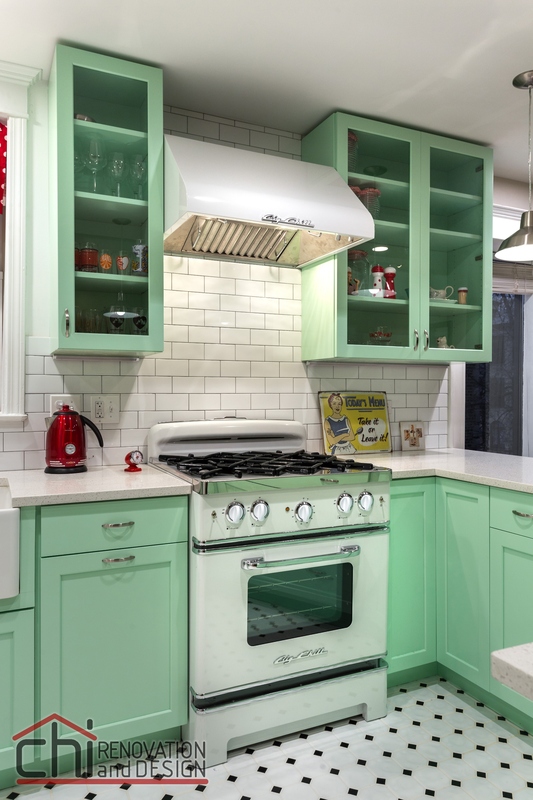 A bold mint green in combination with a retro stove is an absolute statement that this kitchen is all about channeling the past. The black and white flooring only enhances this feeling and the space truly feels like a tiny time machine! 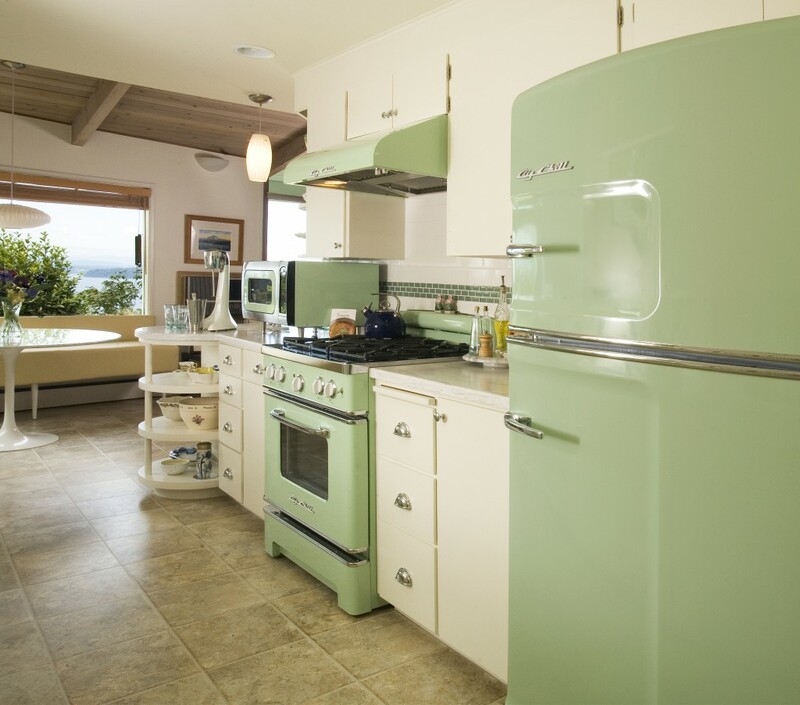 A subtler and darker shade of mint will make the space look breezier, but just as old-fashioned as you need it to be! 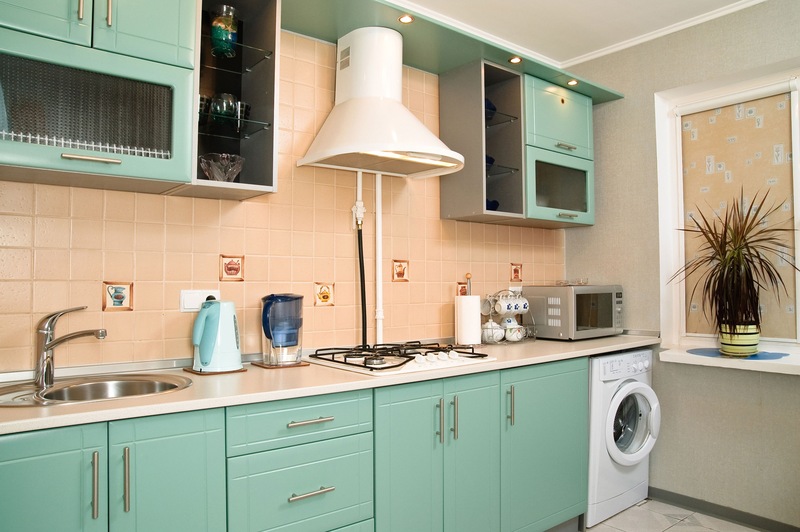 The color is definitely beneficial if you are going for a lively atmosphere! The calming pastels make sure it’s not too vivid and keep it flexible enough to match other decor elements as well, just in case you don’t want to stick to only one style. 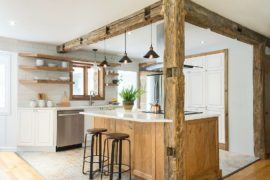 You can mix in some dark rustic wood and see how it works with the retro kitchen setting! 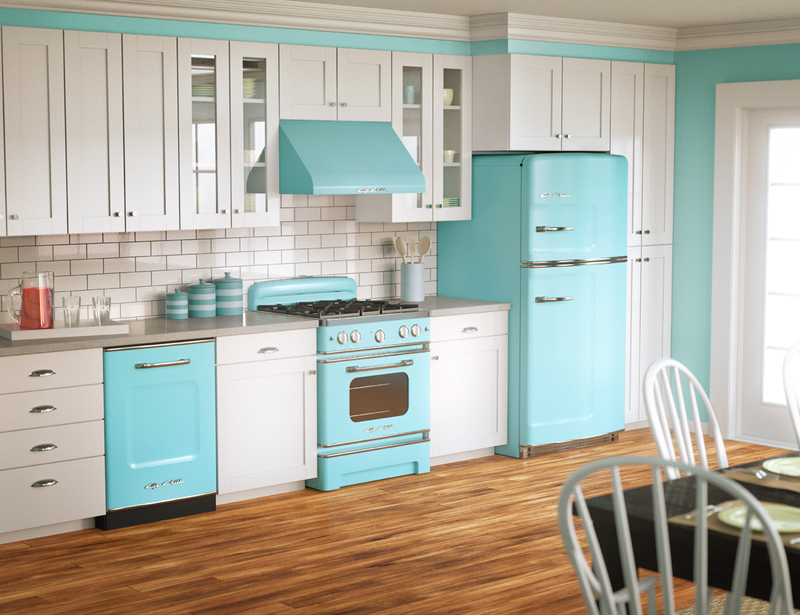 A bright kitchen with striking retro blue elements pulls us into a setting that feels like it’s from an old sitcom. It’s vibrant, cheery and happy! The pastel blue really stands out against the pure white table and chairs in the center, proving this is a simple but meaningful contrast to play around with! 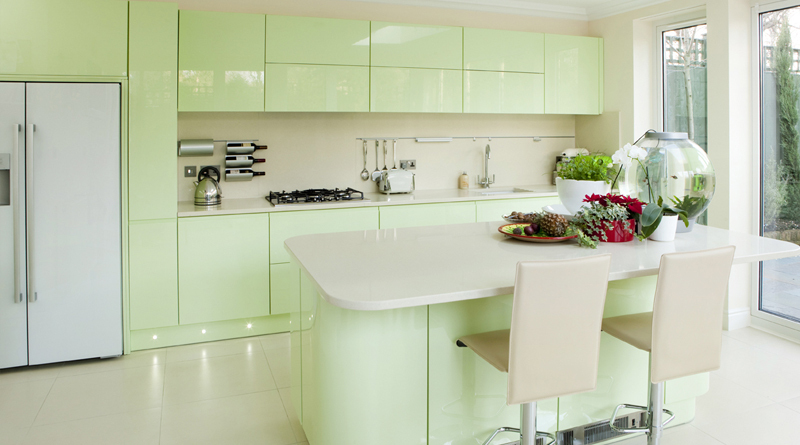 If you want the color to truly be the dominant factor in your kitchen, this is the way to achieve it! 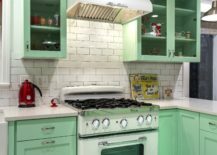 When updating your kitchen with retro appeal, remember that you don’t need to go all out – a few simple elements will do just fine! 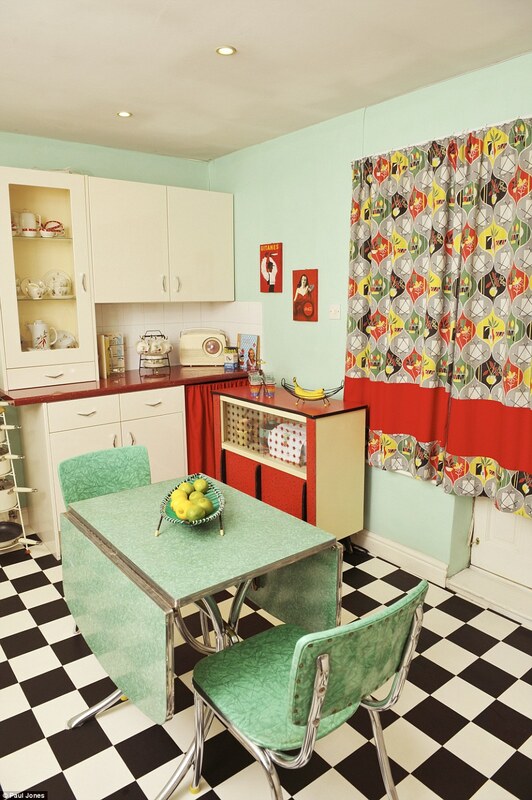 This kitchen retains its bright look, but holds a retro fridge, stove and a matching backdrop! 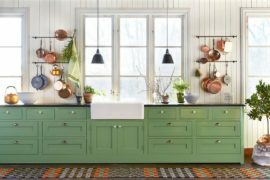 The darker tone of green creates a truly nostalgic space that is just waiting to be lived in! 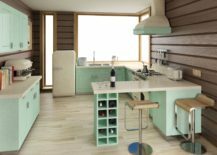 The kitchen can often be the space where so much of family bonding takes place, so embrace that value within the old-fashioned color scheme. 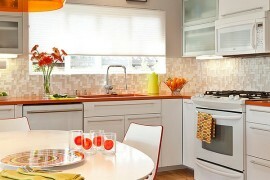 How you style the entire kitchen is in the end what determines its general feel. Every element is of importance; from black and white flooring, to pastel table and chairs. 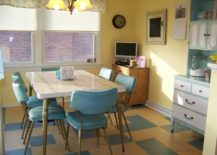 Pick furniture that feels outdated! 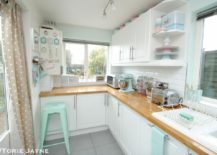 The two kitchens above are perhaps the most modern looking ones of all featured, but we couldn’t move past the pastel green and refreshing mint that subtly carry a strong nostalgic component. 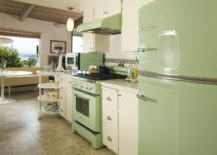 Even when surrounded by modern appliances with a solid contemporary look, the pastels hold onto their time-honored look! 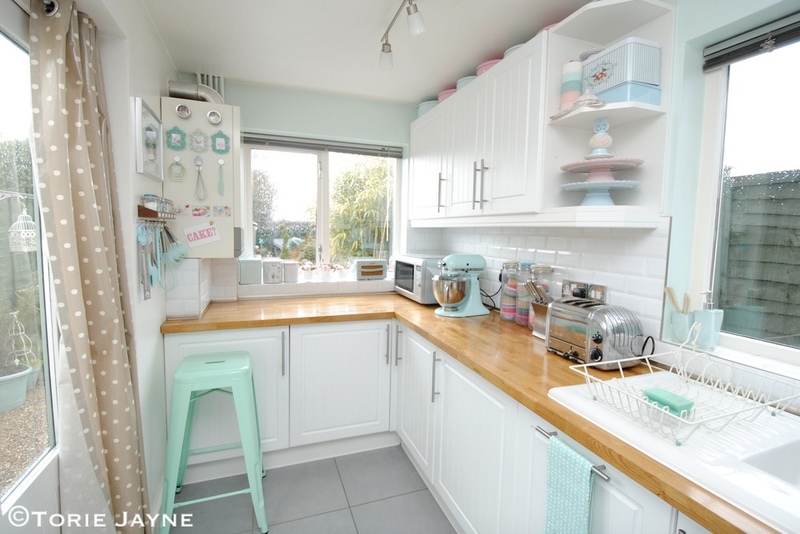 The pastel elements in this tiny kitchen really infuse the space with so much cheerfulness. The size of the space can easily become an issue, so use bright and light colors to make it feel more open. 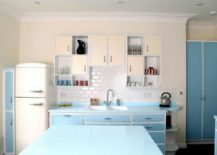 This spacious kitchen easily pulls off the retro look with an abundance of blue that captivates anyone who steps into it, returning them into the times when high-waisted skirts were all the rage and Rock n’ Roll was on the rise! Pink is bold, direct and candid. At the same time it can also be gentle, soft and delicate. 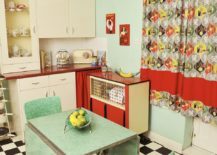 It brings us the best of both worlds, somewhere between tenderness and boldness, catching our eye straight from the get go, but allowing the sacred space that is the kitchen to radiate the energy of the 1950s and all they had to offer! 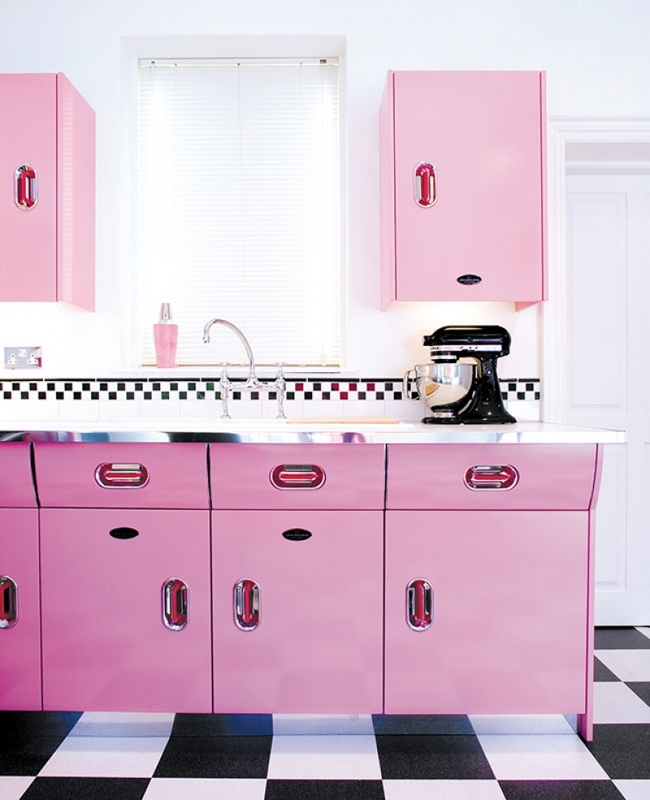 For an all-encompassing retro look pair the all-pink kitchen with checkerboard floors and recreate the classic old-fashioned kitchen scene! 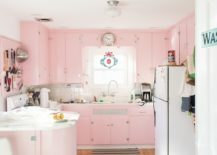 This pastel pink kitchen has such a serene and clean look, it’s almost magical! Creating meals for those you love in a 50’s setting is what dreams are made of! 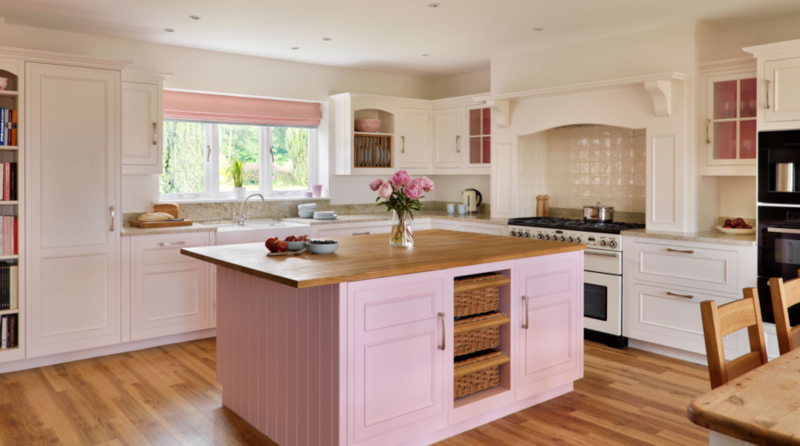 Just one simple pink element can transform the outlook of the entire kitchen. 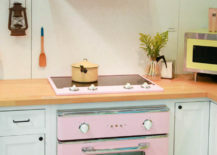 With a sweet pink retro stove you cannot go wrong! 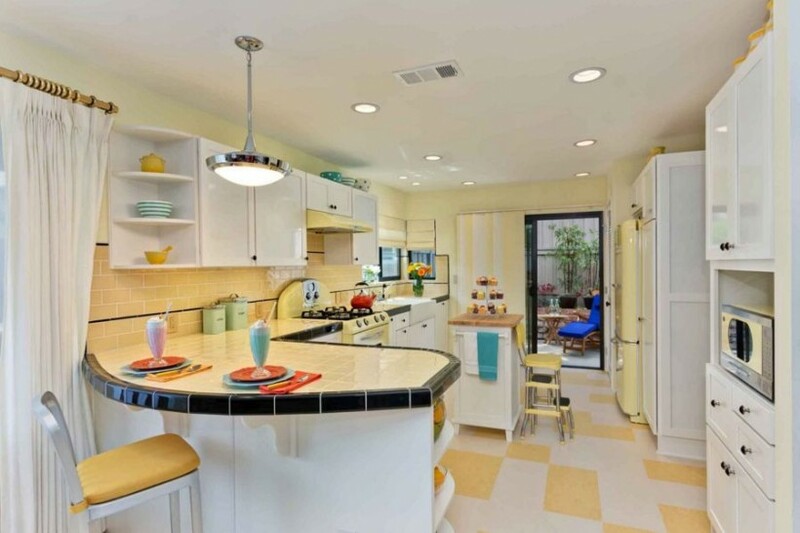 While the kitchens of the 1950’s were smaller and cozier, you can recreate that look within a bigger kitchen too! It’s all about the color, of course! 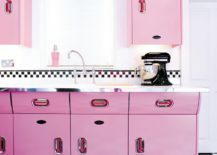 Pink seems like the appropriate choice, since it will give the space a warm and unique look! 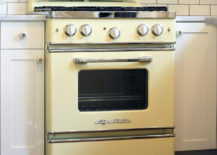 The more retro appliances you can find, the better! Don’t hold back on them, as this is simply one of those styles you can’t possibly overdo! 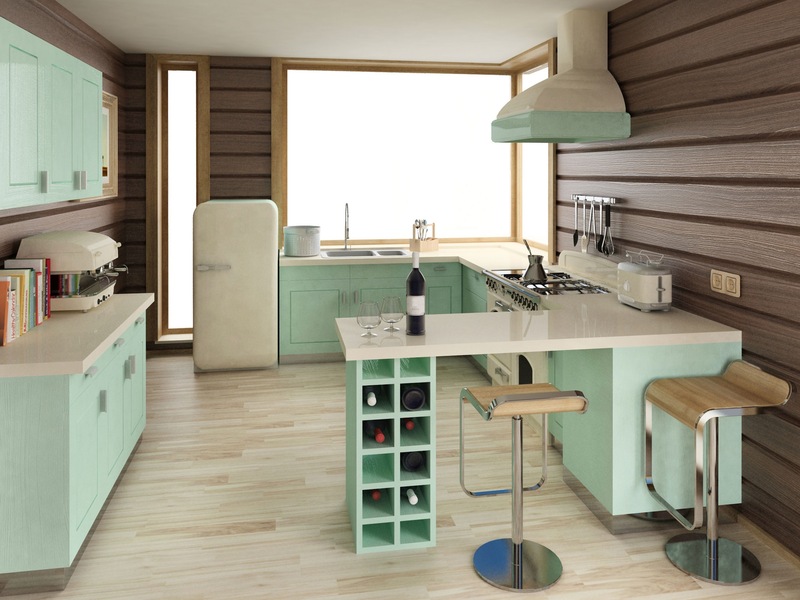 If the main color of your kitchen interior is pastel pink, use some mint green elements to contrast it! 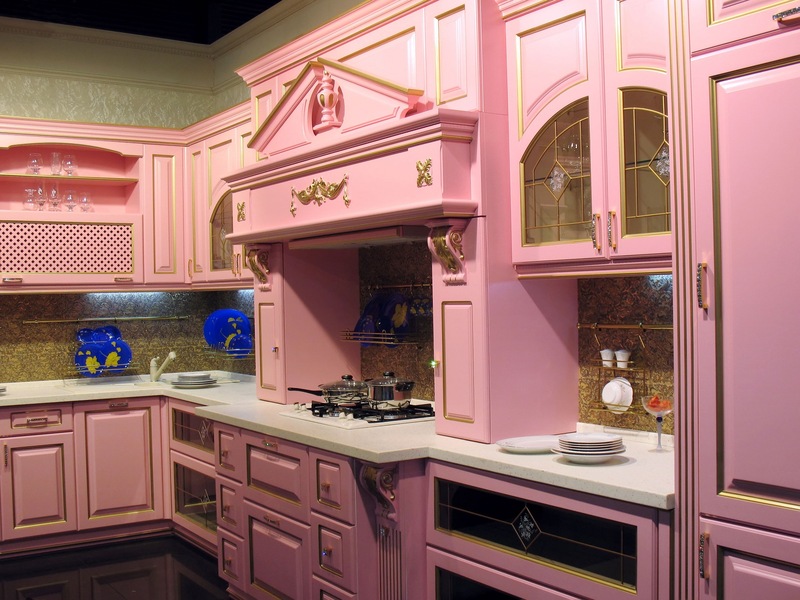 We can easily call this kitchen grandiose and over the top, but with everything that it has going on, it’s precisely its pink color that holds the space for an outdated feeling that almost tricks us into believing we are looking into a different era. 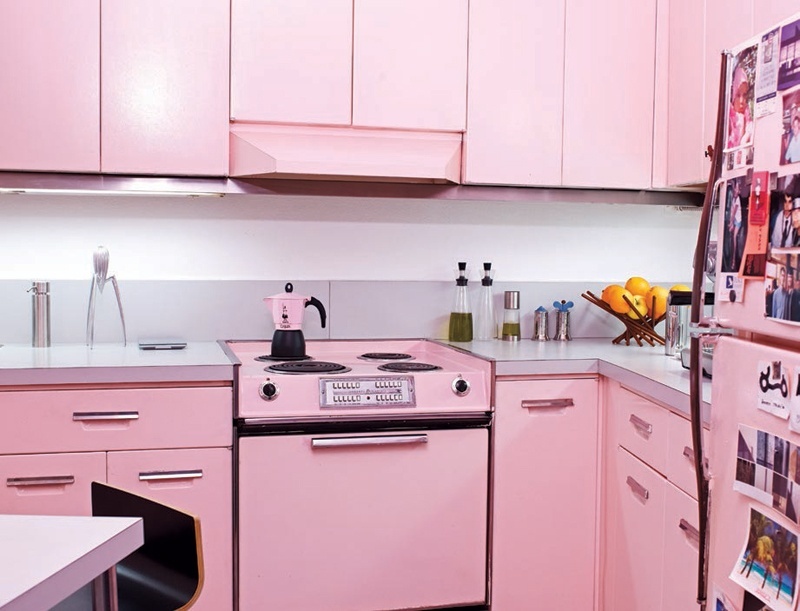 Like we’ve mentioned before, you don’t have to color the entire kitchen in one pastel color in order to achieve a retro look; sometimes one bold and striking element is just enough! 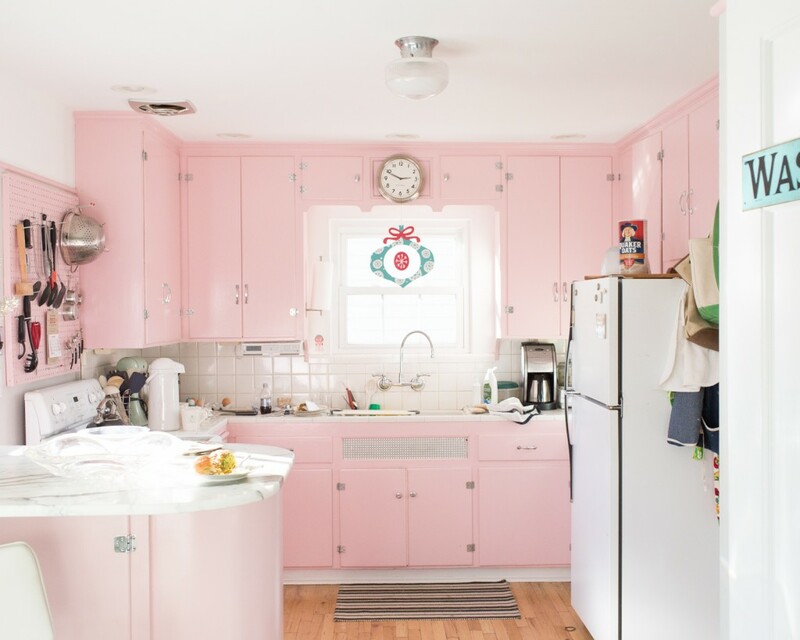 In this particular case, it’s the pink kitchen island that offers great storage as well as holds important decor value. 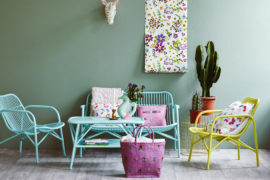 To achieve a fresher look within the retro styling, you can try mixing together different pastel colors or using yellow! 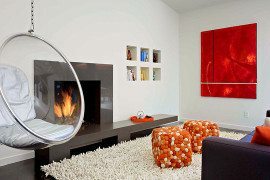 It will brighten up the room and make it feel refreshing, dynamic, like it’s pulsing with life! 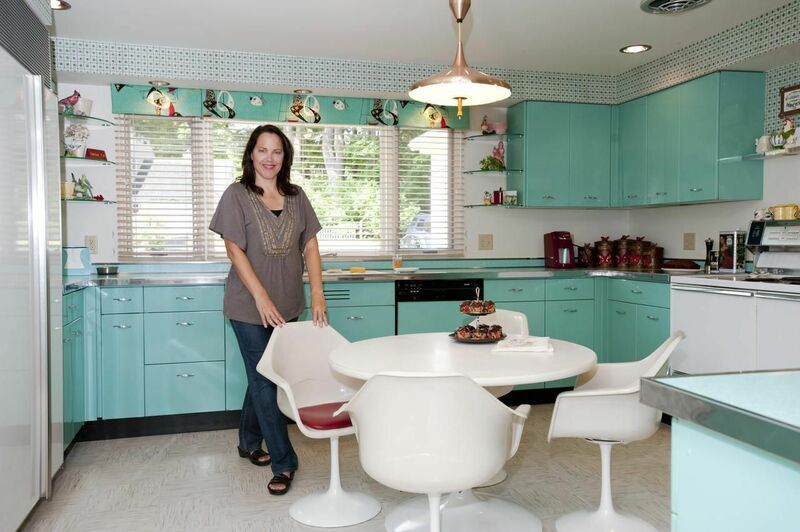 The 1950s look is supposed to feel lively, colorful and fun! Pink and blue, commonly thought of as traditional opposites, have a real appeal when put together. They make the space feel balanced and serene, like everything is in order and there’s not one element that would stand out too much. 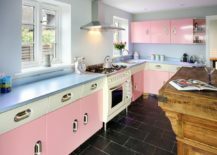 Your blue and pink kitchen will not have a focal point – it will demand to be taken in as a whole. 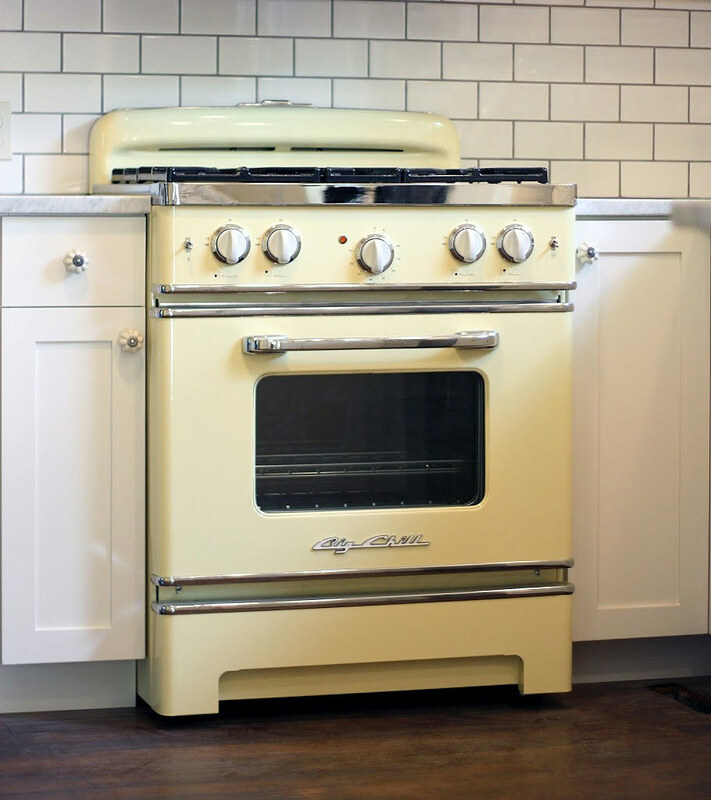 A pastel yellow stove is a very simple element that you can make a part of your existing kitchen that doesn’t necessarily look retro and so channel the era. 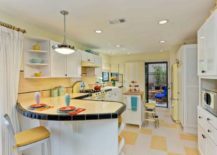 It’s fascinating how powerful one element within a space can be, but yellow is an eye-catching color and even in a pastel shade, it will set the tone for the entire kitchen space! 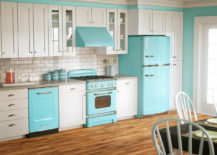 If your colorful kitchen needs a nostalgic touch, pastels will bring that charm with them! 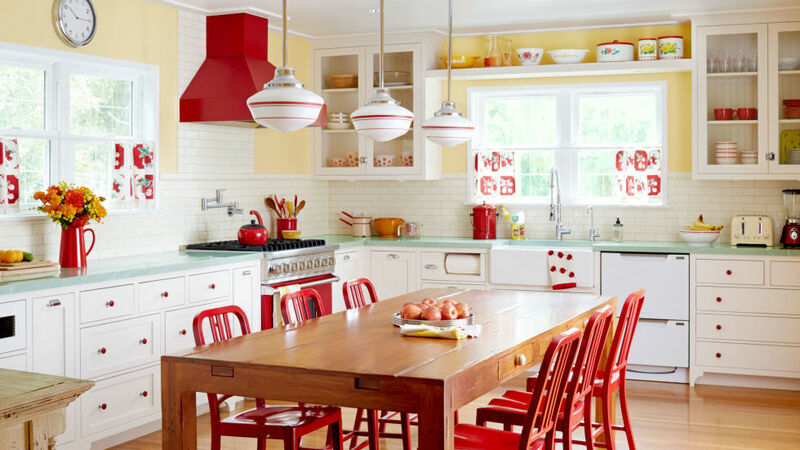 The minty countertop of this kitchen, together with gentle yellow walls, creates a retro contrast to the bold red elements! 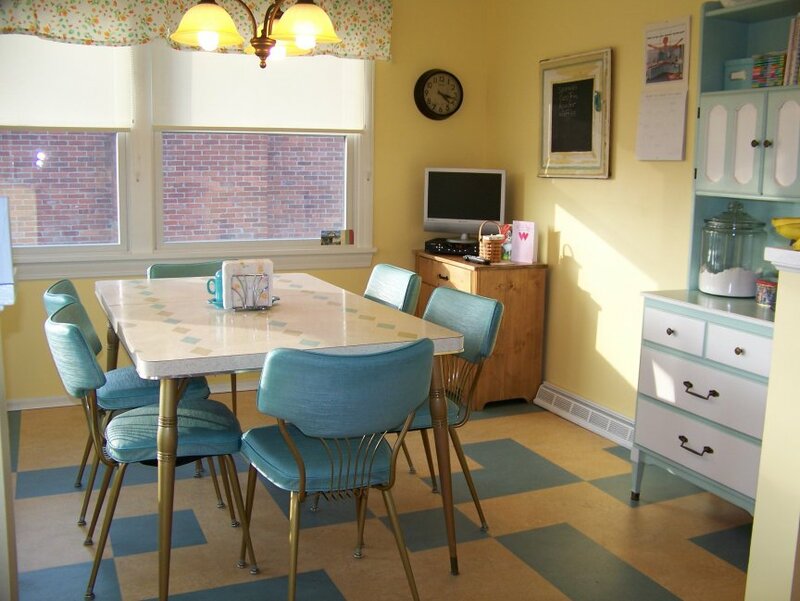 Here’s another lovely pairing of yellow and mint, this one truly embodying the 1950s! The tender color scheme feels cozy and homey! 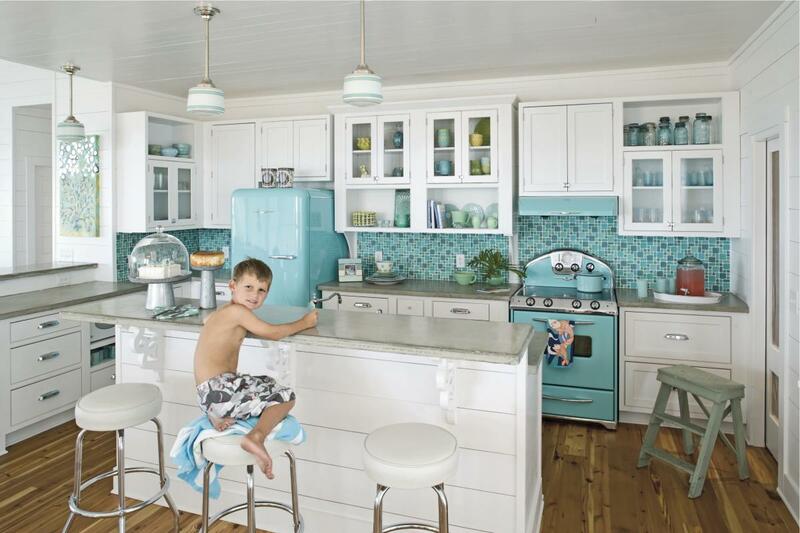 If you find yourself daydreaming about kitchens from times passed, this one will surely inspire you! 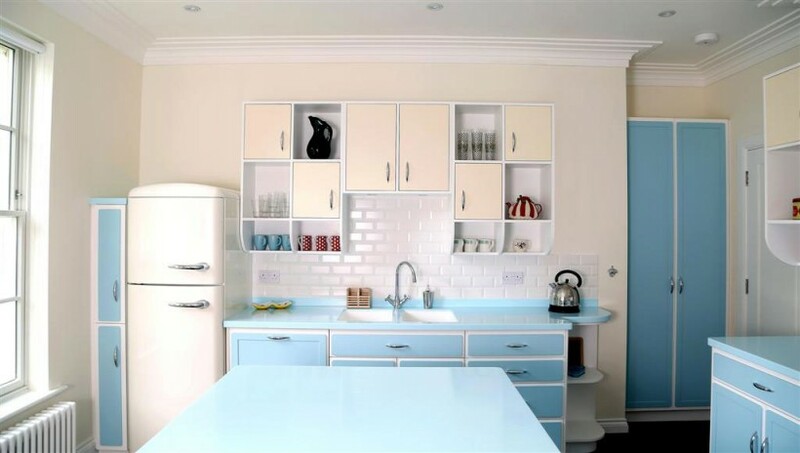 When you are working with a bigger, spacious kitchen and want to capture the retro vibe, color consistency is something to look out for! If you stick to it, it will bind the entire space into a whole, connecting the individual elements together. 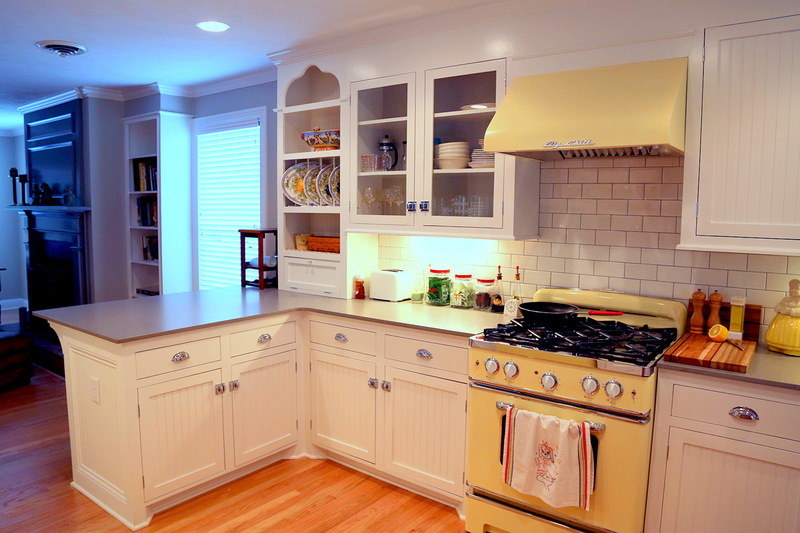 We’re mesmerized by this coherent pastel yellow kitchen!